The typical processes that take place for packed pulp products can be explained by means of following flow diagram. In the above processes, the pasteurization of pulps takes place with the help of steam heating. Evaporation takes place in the vacuum pans so as to maintain the aroma of the fruit/vegetable. The pulp / ketchup is stirred inside steam jacketed vacuum pan. Generally the steam is required in the range of 5-7 bar for above processes. This steam can be easily delivered using Solar thermal systems. Different fruits and vegetables are dried for different applications mainly to remove the water content in them. This process increases the shelf life of the product. Many times vegetables are dried to convert them into the powder form. The process of drying can be done by various methods. Passing hot air over these products is the most popular method. 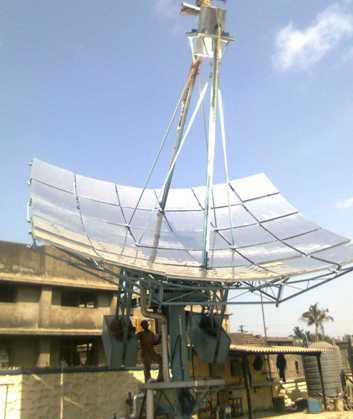 Drying of fruits/vegetables with the help of solar heat is the oldest method of all. With modern solar hot air generation systems, temperatures of 110-200°C can be achieved, which can boost the rate of drying to a great extent. Packed food is often fried using wood fired chull has. The recent trend in this industry is frying using thermic oil system. Frying requires thermic oil at temperatures above 250°C. 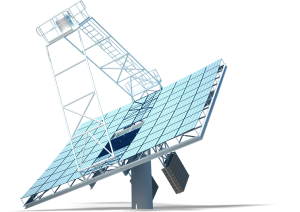 The ARUN® concentrated solar thermal (CST) system can be used to provide thermic oil up to 300°C for solar cooking applications. Many dairy products or other easily perishable products are pasteurized by heating and cooling them immediately one after another. This helps to give the germs a thermal shock and increase the life of the product. The heating of the product is generally carried out using steam of around 6 bar. This steam can be generated with the help of concentrated solar thermal solar system like Clique Solar’s ARUN Solar Boiler / concentrated solar thermal system.